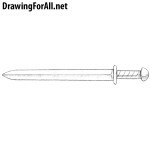 Hello dear readers and welcome to the drawing tutorial on how to draw a xiphos! 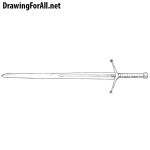 Xiphos is a Greek straight double-edged short sword about 60 cm long. One of the features is that the blade of the xiphos resembles a leaf of a tree. 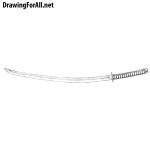 This sword, as we have already said, was common in Greece, then spread to neighboring countries. Despite the fact that the sword is curved from both sides itself is straight. In order to make it straight let’s draw a straight line. 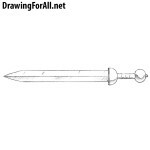 The majority of swords on our site that we drew have round pommels, but the xiphos has a cylindrical pommel. 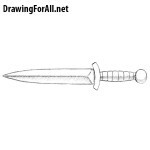 Let’s draw the grip of the xiphos. As you can see in the center it is slightly convex. 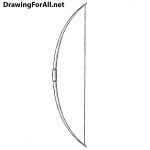 Continue the drawing tutorial on how to draw a xiphos. In this step we draw the guard. But the sword is not a sword if it does not have a blade. So draw a characteristic double-edged curved blade of our xyphos. Very simple, even an elementary step – just erase the line from the first step from the pen. And this step is already quite complicated – using classic hatching we draw out the shadows and using several short strokes sketch out the glare on the blade. Our xyphos looks realistic enough, does not it? If you like this topic, do not forget to visit our lessons about other types of weapons, such as a claymore sword and a spear.